An F-35C test aircraft launches from a test catapult in Lakehurst, New Jersey. As for the F-35C, reports have begun circulating that the aircraft the military says is "the most affordable, lethal, supportable and survivable aircraft ever to be used by so many warfighters across the globe" won't be able to land on aircraft carriers, apparently because its tailhook is too short and is situated too close to its landing gear for the plane to properly grab the arresting cables that enable planes to land on aircraft carriers. The report was first seen last week on the website aviationintel.com and was backed up by a report in London's Sunday Times that has been picked up by press across Britain. Aviationintel.com reported that the design flaw is not fixable because there's just not enough space on the belly of the F-35C to move the tailhook back. British naval sources said the flaws could place the entire JSF program in jeopardy, according to a report in The Daily Telegraph. Britain was expected to buy about 50 of the planes, the Telegraph reported. Jim Murphy, the shadow defense secretary, said, "An island nation like ours should be able to operate aeroplanes from an aircraft carrier. The government must come clean on the full impact of the defense review. It's essential we know how long we will be without carrier strike capability," according to the Telegraph report. Just last week, the U.S. Marine Corps reported it welcomed its first F-35B into its fleet. 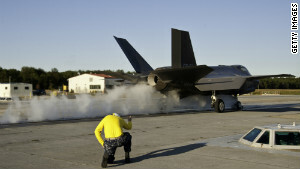 The first Marine jets will be used for training at Eglin Air Force Base in Florida, the Corps said in a statement. Meanwhile, the website Jalopnik reports that aircraft carriers also make great automobile carriers and save the Navy money in the process. 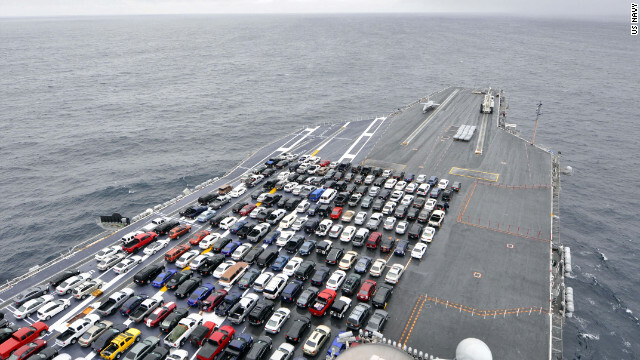 Photos from the USS Ronald Reagan show its flight deck loaded with the personal vehicles of sailors as the carrier travels along the West Coast to Naval Base Kitsap in Bremerton, Washington, where the carrier will undergo maintenance. And the saving money part? "First, the only other way to get vehicles owned by Navy sailors to their final destinations is to put them in another ship. Second, if they didn't send soldiers' vehicles they'd have to pay for transportation at the final destination. Both of which would absolutely cost more money," Jalopnik points out. What would seem reasonable to ask is: Why can't the branches of service somehow coordinate the development and production of things that turn out to be incompatible with each others technology and existing equipment? No wonder we have such incredible waste,redundancy and unnecessary obsolescence resulting in an out of control pentagon budget! This is another classic example of why many think we need to have a serious asessment and pare down the budget for our military services.....outrageous waste has always been their hallmark as anyone who has been in there first hand can attest. They're trying Bill, and the F-35 is an incredible effort with remarkable results to that endeavor. This tailhook issue is just one more small obstacle in a long list of obstacles that they met and will overcome. What you say the services should do is *exactly* what they were trying to do in developing the F-35. See what happens when politics come into play? The obviously superior F 22 was scrapped in favor of the F-35, and now we have to pay for the blunder. Our government, when influenced by global political pressures, makes the worst decisions. While the F-22 may be 'obviously superior', it also cost about 5-6 times as much as the F-35...The F-35 program has done something new – developed 3 variants of a plane that can fight totally different missions yet has a majority of the same parts. Sure, there are flaws, but what's new in aircraft design, development, and testing? That's why there's a test phase to every program; the flaws and kinks will get worked out. What these articles fail to mention are all the positives that have occured during the fairly new life of the F-35. The F-35 has also brought jobs to many different partnering countries along with work in the US. The F-35 and the F-22 are two totally different planes designed to handle different missions. Exactly correct jaydubbe – bravo. B- In the event of war, would you want your child (or significant other) in the superior F-22 or the more affordable F-35? Sounds like an easy decision to me: kill the F-35C and replace it with the B version. Sure our navy then has to deal with the economics of training and additional fuel costs- maybe keep half of the older planes. I'm all for strong defense, but with America's current pending bankrupsy, they really need to cut the AC's from 11 to not 10, but maybe 5. Robert, Right now with 11, at least one is always in overhaul. The Navy has worldwide responsibilities. 5 carriers is ridiculous, the first time there is trouble the President (even this sorry one) asks "Where are the carriers?" Even a landlocked country like Afghanistan saw the power of US aircraft carriers. And I was not a flyboy, I was a submariner, so this is not a bias for airdales. With 4 carriers available (one in overhaul remember) that would be 2 for Pacific, 1 for Atlantic and 1 for middle east/ Indian Ocean. That is nuts. It's not that the Navy wants to cut a carrier, it's that the Administration does not want to provide the money to operate our already too small Fleet, even though like in the past, when theres' trouble the first thing they as for are the carriers. II think the Navy and the US can afford to reduce money in every defense expense but Aircraft Carriers. They , and their F-18´s are the tools the Navy is using to develop their duties all around the world. Do not forget that. Very nice every other high-tech devices or weapons. At the end this are our bread and butter.